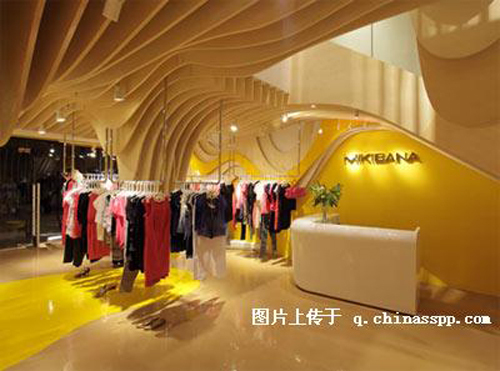 On May 8th, MIKIBANA Shenzhen Bauhinia City Concept Store was grandly opened. The luxurious design concept with water as the concept explained the characteristics of modern urban female surnames, represented the new image of MIKIBANA women's clothing in China, and became the logo of Chinese women's wear. The brand-new double-storefront store built by the top image design company has always maintained the brand's vitality and urbanism. It is inspired by layers of waves and high-altitude sprays that reproduce the tranquility and dynamism of water. The unique visual effects make people feel a natural charm in the noisy city. Taking into account the colorful features of the brand's fashion, the interior decoration of the â€œwater spiritâ€ is not monotonous, and the color is mainly beige. The wood grain and spray that are scattered are better to express the gorgeous style of the clothing, and also allow the consumers entering the store to Visually gain more freedom. The bright yellow that appears between may seem like a touch of sunshine that inspires yearning for life, which is exactly in line with the attitude of the positive modern urban life that the brand wants to convey. When approaching the shop window of the Shenzhen Bauhinia Concept Store, the watermarked doorpost was the first thing that caught the eye. Irregularly superimposed lines are simple but full of impact. There are models wearing gorgeous costumes in the window. Hats, necklaces, belts, stockings, high-heeled shoes and other accessories make the details of the clothing more perfect, but also save the customer a lot of matching Worries, as long as the copy of the whole body is enough to be the focus of attention. Entering the lobby on the first floor, you can walk into the sea of â€‹â€‹fashion. The depth and height of the waves are undoubtedly at a glance. The three-dimensional plate assembly of the roof resembles the organ, and the waves around it are like the waves of the sea, and the notes leaping between the waves. This kind of design is more superior in light rendering effect, making people feel bright but soft. The hangers break through the traditional activity-type placement design and change to a roof-hanging design. Although they cannot be freely moved as before, they provide more convenience for customers' selection and browsing. The height of the hanger is also passed by the designer. Meticulously considered to meet the needs of our customers. Clothing is placed according to color, style and style, making it easier to choose. Three white platforms are displayed on the center of the store to display the latest fashion clothes. The model's shape adds to the dynamics of the entire store. The fitting room is located behind a yellow back panel on the second floor, covered with rose red curtains, and the strong color impact is like a strong heart needle to make you rejuvenate again. The entire store uses three-dimensional plates to display a variety of shapes with a strong sense of modernity through a combination of different sizes and lengths. The unique pattern of water lines allows the idea of â€‹â€‹â€œtaking water as beautyâ€ throughout. When you come here, you will involuntarily feel the coolness of the waves and the mystery of the sea. Although it is only a clothing store, it is even better than an artistic stage full of strong urban fashion. It is believed that every "water spirit" Charlie will come here to forget. When choosing his favorite product, he will feel the new urban dress concept that MIKIBANA has brought to you.